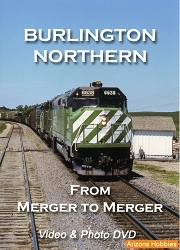 Railfanning with the Bednars Volume 10 follows Dave Augsburger, Big Mike and his pop, Joe Bednar as they head west to pursue other railroad employment opportunities for Mike. With the recession of 1982, Conrail began consolidating divisions and work force. There were few choices for railroad employees. Either relocate to where needed, or the possibility of being laid off. For some, the latter was the only choice offered. The other option was to seek employment elsewhere. Many did just that. They ventured west to find a job with other railroads. In volume 10 we follow Big Mike and crew out to Colorado and points in between to look for work on the western railroads. As usual, Big Mike provides his well known brand of humor. John Pechulis Media, Narrated with commentary by Mike Bednar. Color and original sound; approx 74 minutes.